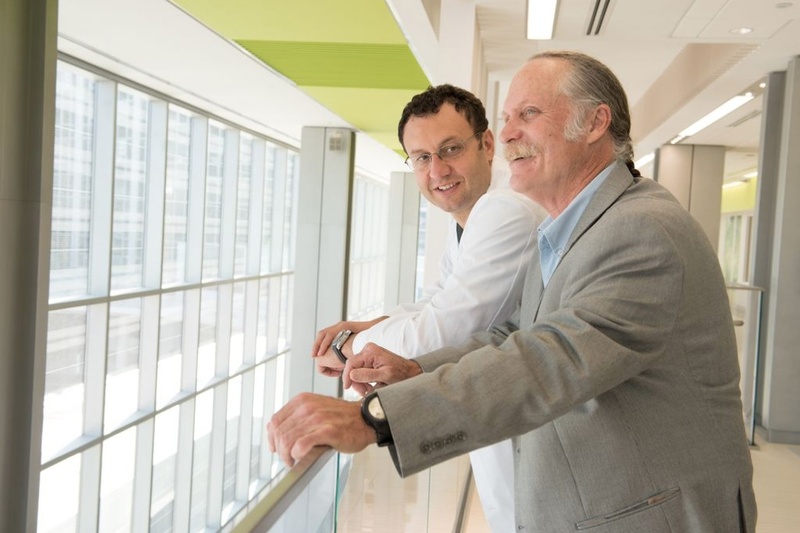 Patient Allan Sustare with his surgeon, Gennady Bratslavsky, MD, in the new Upstate Cancer Center. The two men gave an interview about Sustare’s surgery on Upstate’s weekly talk radio program, HealthLink on Air. Allan Sustare celebrates each day. He is grateful to be alive after coming so close to death from advanced bladder cancer. He admits that he had no concept of the severity of his disease. He had no pain, just blood in his urine — once. He wound up undergoing a novel surgery in which a new bladder was fashioned from a portion of his intestine to replace his original bladder, which had to be removed because of cancer. “I count myself luckier than anybody I know,” says Sustare, 63, of DeWitt. “Between Dr. Seth and Dr. Bratslavsky, I don’t know that anybody could have asked for any better care anywhere in this country.” Rahul Seth, MD, is an oncologist, and Gennady Bratslavsky, MD, is chairman of the Department of Urology. Sustare served as a medic in the military before attending Syracuse University. A professional artist, he has been a jewelry designer, illustrator and maker of collectible pocket knives. At the ribbon-cutting for the Upstate Cancer Center this summer, Sustare shared his story. It was May 2011 when he was diagnosed with bladder cancer. Seth told him his options, which included chemotherapy, radiation and surgery to remove his bladder and replace it with an external bag. Sustare thanked the oncologist. Then he ran away. “I spent most of my inheritance,” he says, describing his time in Houston, in which he pursued alternative treatments. A new tumor had grown by the time he returned to Syracuse. Doctors at the Syracuse VA Medical Center removed what they could of the tumor and then sent Sustare to Bratslavsky. They knew of Bratslavsky’s surgical prowess and his extensive experience in urologic oncology from his work at the National Cancer Institute. Sustare’s bladder would need to be removed because the cancer had invaded the muscle. But Sustare was adamantly against replacing it with an external bag or urostomy. Bratslavsky gave Sustare another option. He could create a new bladder out of a portion of Sustare’s intestines. In an operation that would last all day, Bratslavsky and surgeons he is training in the specialty of urology would remove about 60 centimeters of Sustare’s intestine, cut it open lengthwise and configure it into a sphere. It would then be attached to the urethra and kidneys. In addition, the team would remove the bladder, prostate, seminal vesicles, vasa deferentia and 41 lymph nodes. Such a surgery is not an option for everyone with advanced bladder cancer. But Sustare was a good candidate because he was young, healthy and active, as well as conscientious and responsible, Bratslavsky says. The men spoke before the surgery in 2012, with Bratslavsky explaining what could go wrong. “The role of a surgeon is to go closely over all the options, and help patients understand what exactly the potential pitfalls may be,” he says. A patient who chooses this option has to be able to sense if something is not right with his body. He has to realize he may need to use a catheter to empty the new bladder sometimes. And, nighttime urinary incontinence may be an issue. Sustare underwent chemotherapy first. Then the surgery was done laparoscopically, using the DaVinci robot. His largest incision was no more than an inch. Bladder cancers are prone to recurrence, so Sustare sees Bratslavsky regularly. “It’s only when I get those notices that I have to come in for a CT scan that I even recall that I had cancer,” Sustare says. Between medical appointments, he leads a normal, active life. This entry was posted in cancer, community, surgery, urology. Bookmark the permalink.